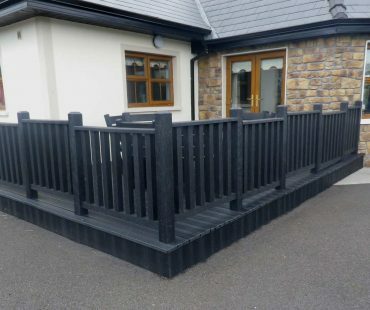 If you are planning to put decking on your property, why not use our maintenance free recycled plastic decking boards? Recycled plastic is ideal material for decking and balcony floors. A deck or balcony floor made from recycled plastic looks natural, is maintenance-free and is non-slip even when wet. The decking planks are 30 x 150 x 3650mm and can be supported using a wide range of recycled plastic support beams. The decking is easy to install for any DIY enthusiast and there is an instruction leaflet available with easy to follow step by step instructions. The decking planks can be used in balcony floors where the steel structure can be easily constructed to facilitate the decking planks.